I'll be posting Chicago trivia questions all week. The first student commenter to successfully answer the question will receive one (1) bonus point to apply to either their choir or band grade. Please, no emails. You must post a comment and sign with your first name to get the prize. Band and choir students in grades 5-12 are eligibe. Let the googling begin! 1. What is the proper name of the artwork? 2. Where is it located (specifically)? 3. Who is the artist? 4. How much did the work of art cost to make? It looks like a huge egg! Specifically it is located in Millennium Park. Cost- It was orginally estimated to be 9 million but it turned out to be 23 million. Proof I didn't copy Paige-(Extra info. 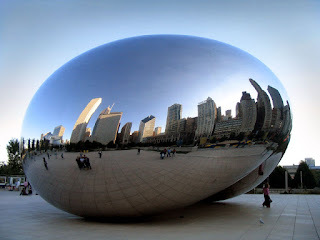 )- Its Nickname is the Giant Bean or the big silver thing in Millennium Park. It is made out of stainless steel plates over a fortified steel frame. It is actually Hollow inside of it.